The last Neanderthals in Europe died out at least 37,000 years ago – and both climate change and interaction with modern humans could be involved in their demise, according to new research from the University of Bristol published in PLoS ONE. Although the reality of this ‘Ebro Frontier’ pattern has gained wide acceptance since it was first proposed by Professor Zilhão some twenty years ago, two important aspects of the model have remained the object of unresolved controversy: the exact duration of the frontier; and the causes underlying the eventual disappearance of those refugial Neanderthal populations (ecology and climate, or competition with modern human immigrants). These findings have important implications for the understanding of the archaic features found in the anatomy of a 30,000 year old child unearthed at Lagar Velho, Portugal. 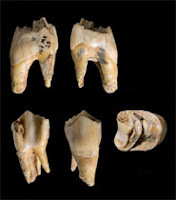 With the last of the Iberian Neanderthals dating to many millennia before the child was born, ‘freak’ crossbreeding between immediate ancestors drawn from distinct ‘modern’ and ‘Neanderthal’ gene pools cannot be a viable explanation. The skeleton’s archaic features must therefore represent evolutionarily significant admixture at the time of contact, as suggested by the team who excavated and studied the fossil. Professor Zilhão said: “I believe the ‘Ebro frontier’ pattern was generated by both climatic and demographic factors, as it coincides with a period of globally milder climate during which oak and pine woodlands expanded significantly along the west façade of Iberia. “Population decrease and a break-up of interaction networks probably occurred as a result of the expansion of such tree-covered landscapes, favouring the creation and persistence of population refugia.